Dante Gabriel Rossetti was a highly respected 19th century painter from the UK who was an integral member of the Pre-Raphaelite Brotherhood. This website covers the life and career of Dante Gabriel rossetti in full as well as offering a gallery of the British artists most famous oil paintings, which all came about in the mid to late 19th century at which point the pre-Raphaelites were at the height of their success. British art is well known for several different art movements but it's artists were most significant here in the Pre-Raphaelite Brotherhood as well as romanticism that came about somewhat earlier. Rossetti was highly passionate about both his own work but also the art movement in which he was involved. There was a great belief here that painters should aim for creativity and innovation and the title for the Pre-Raphaelites refers to an Italian artist who they felt was far too traditional and academic in style. The romanticist period included British art heavyweights like John Constable and JMW Turner who were devoted to landscape painting and spent their whole careers experimenting with different locations within the uk. Rossetti was also respected as an illustrator, translator and poet which underlines his versatility as an individual as well as pointing to the limitless ambition which helped to drive forward the preraphaelites. This art movement in which Dante Gabriel Rossetti was so influential was some what overshadowed during the 19th century by French impressionists such as Claude Monet whose bright landscapes proved to be to the taste of the majority of the European art public. 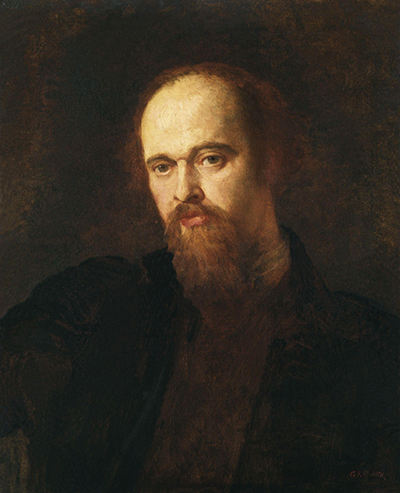 John Everett Millais, Edward Burne-Jones and William Holman Hunt joined forces with Rossetti to launch the pre-raphaelite brotherhood which later brought in many other significant British painters such as John William Waterhouse whose career followed some years later and took advantage of some of what had gone before. Millais created a career of his own that took the principle ideas behind this new art movement but combined it with his own creative mind and exceptional technical ability. John William waterhouse also followed a similar path and together they produced classic paintings such as Ophelia and the Lady of Shallot. The aesthetic movement followed on after the preraphaelites and is known to have been influenced by Rossetti paintings, as were members of the European symbolism movement as well. These two art movements are certainly lesser known than the Pre-Raphaelites though whose work is still much loved today, particularly within the uk and America who see it as an excellent alternative to impressionism. British artists have commonly dabbled with watercolours with in their careers and Rossetti was one such artist who became disillusioned after some criticism of some of his early oil on canvas paintings. He preferred private sales which protected his reputation and privacy. British artists had long since trailed behind fellow european artists during the renaissance and baroque periosteum but started to gain greater academic acceptance during the later eras of romanticism and then Pre-Raphaelites. Rossetti preferred to use symbolic and mythological topics within his paintings to entirely realistic settings and this is very much a hallmark of the group of painters with which he was strongly connected. We hope that this website has helped to develop your interest in Dante Gabriel Rossetti and all of the links provided within this website offer you the opportunity to buy Rossetti paintings as art print and poster reproductions to add to your own home. The art.com Rossetti prints gallery comes highly recommended so feel free to check it out. Rossetti produced many portraits within his career and this meant that he held a selection of favored models who he would frequently call upon in order to create new works. It is generally accepted that Rossetti held close relationships with several of these models and this is highly common for painters from all artistic periods. Please see below for a summarised list of the best Dante Gabriel Rossetti paintings that are featured throughout this website. Disclaimer: www.DanteGabrielRossetti.org is a personal website covering the career of famous British painter Dante Gabriel Rossetti, but is in no way an official website for Dante Gabriel Rossetti and www.DanteGabrielRossetti.org does not claim to be that in any way. The Estate of Dante Gabriel Rossetti and their presence hold all necessary copyrights and licences for all of his paintings and other works. All prints, paintings and photos included in www.DanteGabrielRossetti.org are provided as an affiliate to Art.com who hold necessary permissions. Art.com pay us small commissions based on any prints or paintings that you buy as a result of using this website.